Word has reached our group with the passing of retired Delta pilot Captain Bob Mackey, age 68. Captain Mackey joined Delta Air Lines 09-07-1979 and was based 030/DFW. He is survived by his wife Barbara, their children and grandchildren. Dallas-Fort Worth National Cemetery, 2000 Mountain Creek Parkway, Dallas, TX, US, 75211. Robert J. Mackey, 68, passed away peacefully at home following a courageous battle with cancer on Sunday, November 19th, 2017. Born in Pensacola, FL on November 25th, 1948 to William A. and Warren Jemison Mackey, he graduated from Arlington Heights High School in 1966 and the Naval Academy in 1970. After marrying Barbara Murdoch on June 6th, 1970, Bob embarked on a lifetime of service to others. He served his country flying with the Navy for 9 years active duty, 18 years in the Naval Reserve and another 20 recruiting for the Naval Academy. As a Delta Air Lines pilot Bob served countless travelers and retired as Chief Line Check Pilot on the 737 in 2004. From 1983 to 1987, Bob was elected to four terms with the Keller ISD school board, serving as Board President for several years. Golf would wait as Bob began teaching Geometry and Calculus at Keller High School in 2006. He was selected as 2009 High School Teacher of the Year, and served as Math Department Chairman from 2010 until 2014. In 2014, Bob’s fourth career began, serving others through his Lord and Savior, Jesus Christ, as a Church Building Chairman, Deacon and Elder with Lakeside Presbyterian Church PCA. 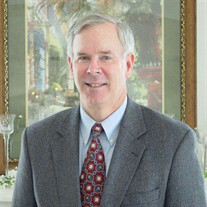 He is survived by his loving wife of 47 years, Barbara; and their two sons and families: Robert, Jr. (wife Kimberly), their children Jordan, Carter, and Peyton; Stephen (wife Mollie), and their son Parker; his brother William Mackey (wife Sue); and sister Sue Mackey Augustus (husband Jim). inform you that our fellow alum Robert "Bob"
he flew for Delta for many years.